How will our parenting decisions today effect the adults our kids will become tomorrow? Molly Skyar, in open conversation with her mother, Dr. Susan Rutherford, view parenting decisions through a psychologist's perspective. Question: My First grader is being bullied at school. How do I address this and with whom? DR. SUSAN RUTHERFORD: I think there are a couple lines of approach with this. First of all, as a parent she should recognize that being bullied can be a really hard thing for a child to deal with, and unfortunately, it’s not that unusual for a child to encounter at some point in their schooling. In my experience, it’s common to see bullying behaviors in 6th, 7th and 8th grades among girls, for example. I’m not sure what goes on during that those years inside their brains, but girls can be terribly mean to each other and gang up on each other then. One of the things this mom will want to do to help her six-year old is, when the child comes home and tells her about the bullying, is to be sympathetic and not dismiss it. She'll want to acknowledge how difficult this is for the child and talk to her about avoiding the bully, if possible, or finding new friends, if that’s the issue. If the bullying behavior continues, the teacher needs to be made aware of what’s going on in the playground. The child might be able to tell the teacher herself, but if she is uncomfortable doing so that would be the time for the parent to step in and have an informal conversation with the teacher to ask if the bullying behavior has been noticed. MOLLY: This question was submitted to our website by a mother in New York City. I think a lot of this kind of stuff happens on the playground and out of the teacher’s sight. DR. RUTHERFORD: Parents have to take this step by step. The next step after talking to the child would be for the parent to alert the teacher to what’s going on so the teacher and aides can start watching for inappropriate behavior in the classroom and on the playground. If the bullying occurs after school, like on the bus or while walking home from school, it might not fall under the teacher’s jurisdiction. At that point, I would suggest contacting the parent of that other child. I saw a case like this in my office where the child was being bullied on the bus ride home after school. The child was about nine years old and another nine-year old boy would approach him and inform him of the horrible things that were going to happen to him. The boy went home and told his mother who then spoke to the parents of the bullying boy. Those parents denied that any of that could have happened, leaving the mother with no choice but to go to the school and talk to the teacher and to the principal. That actually worked: the school administration called in the parents of the bullying boy and it was taken care of on that level. They decreed that the bully had to sit directly behind the bus driver in a seat by himself because he wasn’t just bullying this one nine-year old boy, it turned out that he was bullying other kids on the bus as well. As a parent, we have to take such intervention step-by-step, and be sure to support our own children when they need extra help. MOLLY: Yeah, you always have to protect your child. DR. RUTHERFORD: Bottom line: a parent should protect and advocate for her child when necessary, but should always encourage the child to try to work it out for themselves first. MOLLY: What can happen if we don't address an issue like this at the time and the bullying continues? DR. RUTHERFORD: Duke University recently released a report about the effects of childhood bullying and how they last into adulthood. The study found that victims of childhood bullying were more likely to suffer from anxiety disorders and panic attacks as adults. 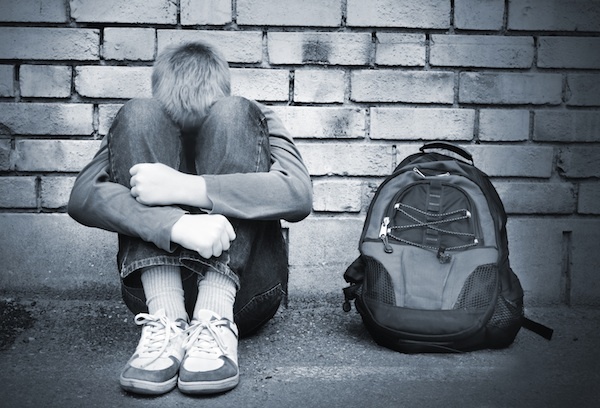 Interestingly, they also found that the adults who were doing the bullying as kids were more likely to be diagnosed later with anti-social personality disorders and show lifelong patterns of blatant disregard for and violation of the rights of others. We can see that bullying behaviors can have lasting effects on both the bullied and the bullier. Clearly, it's important to address this issue early on before it leaves a permanent impression on a child's personality.